Merrythought, Yawl, 73 tons. Mr. A. G. Wildy. fastest yachts of her class. Mr. Wildy raced a great deal on the Thames between 1875 and 1888. He was helmsman on board the Amphitrite when she won the Queen’s Cup at the Royal Portsmouth Cor­inthian Regatta in 1889, and, in addition to holding a master’s certificate, he has passed the Board of Trade examination on the syllabus of the compass. 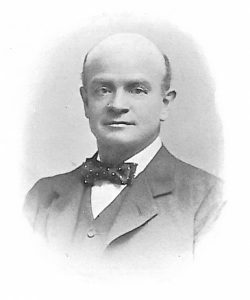 He was from 1884 to 1888 Rear Commodore of the Junior Thames Yacht Club, and assisted in promoting the Channel matches for amateurs between Sheer­ness, Ostend, and back to Portsmouth in 1884, 1885, 1886, and 1887. Mr. Wildy now owns the Merry thought, 73 tons, built by Messrs. 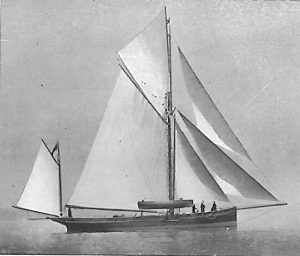 Camper and Nicholson in 1875, and is part owner in the Alannah. He is a member of the Yacht Racing Association. Clubs: Royal Thames, Royal Corinthian, Royal Cruising, Essex, and Norddeutscher. Address: 1, Ray­mond Buildings, Gray’s Inn, W.C.